Australia 460 (Michael Clarke 106, Mitchell Johnson 92*, Shane Watson 83, Dhammika Prasad 3-106) beat Sri Lanka 156 and 103 (Angelo Mathews 35, Kumar Sangakkara 27, Mitchell Johnson 2-16) by and innings and 201 runs. The powerful batting of Sri Lanka relinquished twice against the lethal bowling of Australia as the hosts won the 2nd Test with a huge margin of an innings plus. Sri Lanka managed 156 runs in the first innings followed by 103 mere runs in their second whereas Australia hammered 460 runs in the only innings they played. 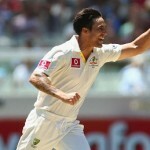 Mitchell Johnson (Australia) was declared ‘Player of the match’ for his superb all-round performance. 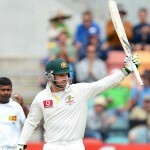 He grabbed six wickets and smashed unbeaten 92 runs while batting at lower order. 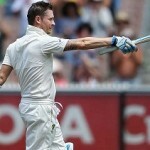 The second Test of the three match series concluded on day three of the game which was Friday, December 28, 2012, at Melbourne Cricket Ground. Earlier, the Kangaroos initiated the day at 8-440 in 129 overs, Mitchell Johnson and Nathan Lyon were at the crease with 73 and 0 respectively. The home side lost their first wicket after the addition of 11 runs to their overnight score as Lyon was gone for just one run. Jackson Bird replaced him as Johnson hit the first four of the day in the 134th over. Bird was clean bowled by Shaminda Eranga for a duck on the fourth ball of the next over. Mitchell Johnson remained unbeaten for 92 off 150 deliveries with 7 fours as the Australian innings was folded back on 460. Shaminda Eranga and Dhammika Prasad were the chief wicket takers with three each, Angelo Mathews secured two as Tillakaratne Dilshan chipped in with one wicket. Sri Lanka had a dreadful beginning of their second innings when they lost both their openers in the very first over. Dimuth Karunaratne ran himself out on the third ball and Tillakaratne Dilshan was caught smartly by Ed Cowan at short leg off Mitchell Johnson without opening his account. 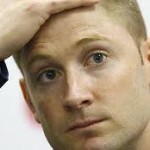 The miseries were multiplied when the stumps of their skipper, Mahela Jayawardene, were uprooted by Jackson Bird on the last ball of the next over. The Islanders were reeling at 3-3 when Thilan Samaraweera was declared leg before wicket off Bird for just one run after 10 runs were added to the total. The experienced Kumar Sangakkara and the young Angelo Mathews got together in the centre and tried to mend the early loss under trying conditions. Sangakkara went on with his natural game by hitting a couple of fours in the following overs and Mathews hit two back to back boundaries in the 13th over which was the last before the lunch interval. The visitors reached 4-43 at the break with Sangakkara and Mathews batting at 22 and 17 runs accordingly. The duo opted to play aggressively even after the lunch interval and added 15 runs in the 15th and next over with the assistance of 3 fours. Kumar Sangakkara was badly hit on his left index finger by Johnson on the second ball of the 17th over. He was retired hurt at 27 as the score reached 62 and replaced by Dhammika Prasad. The score was enhanced to 74 when Angelo Mathews was clean bowled by Johnson for 35 off 48 with 5 fours. Rangana Herath walked in next as Prasad dispatched two back to back sixes on the first two balls of the 23rd over from Nathan Lyon. The bowler took the revenge on the next ball by removing Dhammika Prasad for 17 as the score touched 102. Shaminda Eranga was the seventh batsman who went back to the dressing room for a duck as Prasanna Jayawardene and Chanaka Welegedara were absent hurt. Rangana Herath was in the centre batting on 11 when the second innings of Sri Lanka was squeezed for 103 runs in 24.2 overs. Mitchell Johnson and Jackson Bird shared the honours of the day with two wickets each whereas Peter Siddle and Nathan Lyon shared one wicket each. Australia won the second Test with a mammoth margin of an innings and 201 runs and they have clinched the three Test series 2-0. 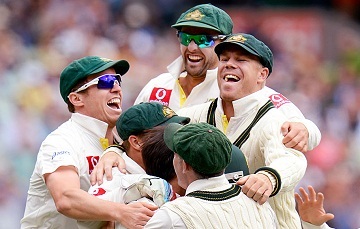 The third and final Test of the series will be played at Sydney Cricket Ground from January 3, 2013.